BASE provides a range of training and consultancy services through our trading arm, Inclusive Trading CIC. We can tailor courses to your needs and can deliver a range of consultancy support. We are available for services to commission courses for their staff teams. It may be possible to arrange for additional delegate places to be made openly available if you don't have sufficient numbers for a dedicated course. To see our currently advertised courses, please got to our training course listings page. Please use the links below to find out more about our provision or contact us if you have a specific query. We now have over 300 people enrolled on the certificate course and we've had excellent feedback. This 4-5 day course is not accredited but provides most of the underpinning knowledge within the National Occupational Standards for Supported Employment. We can also tailor specific aspects of supported employment training to be delivered over 2, 3 or 4 days. 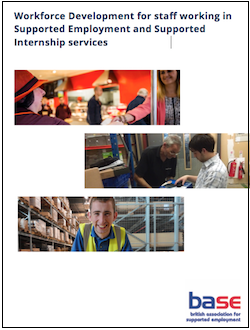 We can provide a full package of support for organisations establishing or developing their Supported Internships provision. This three and a half day course teaches structured training techniques. This two day course has been delivered to staff from over 75 organisations across Britain and abroad and always gets great feedback from participants. We can provide support to commissioners and operational services, including programme design, tendering support, and service evaluation. BASE also works with a range of freelance trainers who deliver training on a variety of topics including TSI, Job retention case management. Click here to view their details. Please contact us if you are interested in becoming an associate of BASE.